Computers are an integral part of business life. We have many years experience of successful systems implementation having assisted a large number of clients with their business installations. In recent years accounting software has become much easier to use and cheaper to acquire, but the choice remains bewildering. Some businesses prefer to focus on their core activities and to outsource administrative tasks. In these circumstances tasks such as bookkeeping should remain a high priority because they provide the basis for generating the management information needed for effective decision-making. We are experienced in using, supporting and supplying a range of accountancy packages and are able to recommend solutions that are suitable for businesses ranging from those with very simple accounting requirements to those requiring complex solutions. We can recommend sensible and cost effective solutions for very small businesses that may not previously have considered computerised accounting, but will need to do so with the advent of Making Tax Digital. The combination of our professional accountancy background and our knowledge of accounting software products places us in an excellent position to advise, source, install, train staff and provide support on bookkeeping and accountancy software. We are a member of the Sage Accountants Club, which enables us to supply and advise on a wide range of Sage accounting products including Sage Accounts and Payroll. 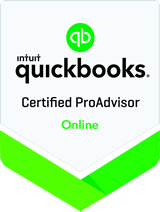 We are also able to advise on and support Quickbooks, TASbooks, Xero and many other accounting products.